Coming to the United States to attend HIMSS is always a great adventure, and one that I look forward to each year. As usual, this year’s HIMSS Conference in Orlando had a large international presence, with representatives from around the world present to learn about the latest healthcare technology trends that are happening in the U.S. and abroad. 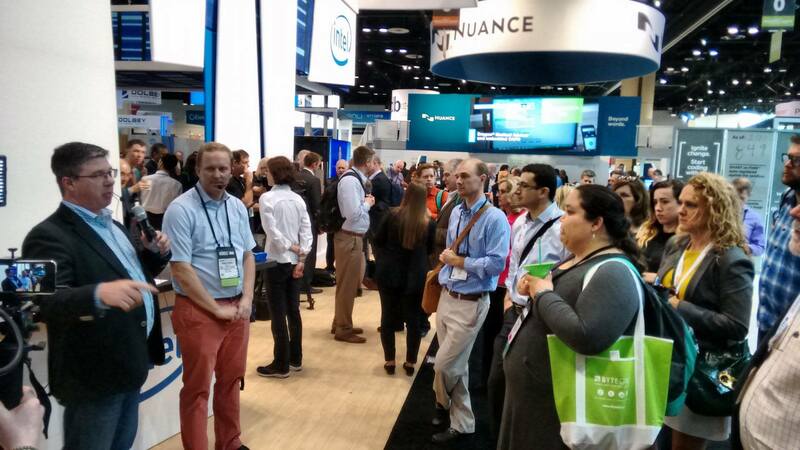 Here are a few insights from what I saw at HIMSS, and how a few international visitors experienced the event. I saw a real interest in exploring the value of Artificial Intelligence in health. I had several conversations about machine learning and noticed an intense effort to leverage this technology to deliver better patient care. There is a shift to outcomes-based purchasing strategies coming from Accountable Care Organizations (ACOs) that is changing the landscape of care delivery. Providers are being incentivized to demonstrate health outcomes from care delivered, which requires much better systems for delivering precision medicine, recording and measuring progress/change in clinical state, and decision support systems, to enable this data to influence decisions made at the point of care. The third theme I saw was a recognition that to achieve population health improvements, the individual needs to take responsibility for their own health and wellness. We see technology enabling this through health providers delivering health portals and setting up prevention services supported by wellness apps. The convergence of these themes was evident during a lunch session that Intel hosted with SAP and DellEMC that focused on better patient outcomes and shared a cancer center’s journey toward using real-time insights. Gustave Roussy, one of the world’s leading cancer-research institutes and a premier European Cancer Centre, has embarked on a journey to unlock oncology data to provide its oncologist and researchers with real-time insight for improved patient outcomes. During the session, Charles Ferte, Medical Oncologist, MD, PhD from Gustave Roussy, shared how the cancer center is shifting to real-world evidence based outcomes that will revolutionize how they care for their patients and how Intel and DellEMC helped to implement that solution. They will further expand this approach and create a network with other institutes (Cancer Core Europe) and generate large, virtual cohorts to gain more data. On the international front, a large contingent from the Nordic countries showed special interest in interoperability and how to move legacy systems over from existing environments to insight/decision support at the point of care. Johan Liden from our Intel team said there was also strong discussions around data lakes inside hospitals and the need for sharing data for clinical use. Overall, most were in favor of designing new systems around clinical workflow when it comes to data. A French delegation shared with our France lead, Nisrine Belhaj Soulami, that they are facing some big changes in 2017. The French Ministry of Health has set a deadline of the July 2017 for all hospitals to submit their strategy on how they are going to achieve cost savings through purchasing services, IT, training and research. With this in mind, the contingent visited with the Mayo Clinic where they saw the use of eHealth and telemedicine in action. These are the types of solutions that local French hospitals are experimenting with, and running proofs of concepts. There is also a national Genomics Plan in France, so research hospitals are keen to attract funding from this new initiative. They are looking to invest in sequencing and demonstrating their ability to provide clinical services based on this. The more I reflect back on HIMSS 2017 the more I see commonality across the globe for utilizing technology, data insights, and new processes. The pace of adoption is quickening as patients are demanding a more personalized approach to their care and it’s evident that countries, and health systems, are moving as fast as they can toward adoption and implementation to meet this need. What was your experience at HIMSS this year? What did you learn?